If you want the puppet's pieces to rotate correctly, you must set the pivot points onto the articulations. You can set the pivots using the Rotate tool which sets it for the entire layer or you can set the pivots directly on your symbol and have a different pivot for each symbol cell. 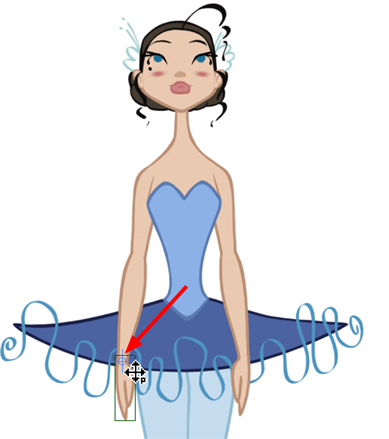 By default, when you create symbols, the symbol pivot is located at the centre of your drawing. You will need to move it onto the shoulder or elbow. You will set the pivot on the symbol's cells, not directly on the drawings. To set your pivots, you must be at the top level of your character building scene and not inside the symbols. By default, when you set the pivot onto a symbol, all the cells use the same pivot. If you need different pivots for different cells, refer to the following procedure. Do the following steps for each layer in the Timeline view. In the Tools toolbar, select the Drawing Pivot tool or select Drawing > Tools > Drawing Pivot. In the Camera or Timeline view, select the symbol on which you want to set a pivot. 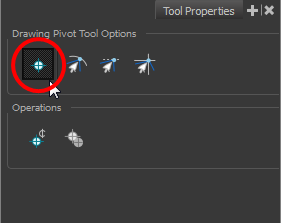 If you only want to set one pivot for your symbol, in the Tool Properties view, select the Set the Pivot for Symbol on All Frames button. ‣ Deselect this button if you want to set a series of different pivots for your symbol's cells. In the Camera view, click where you want the pivot to be. You can also drag the pivot marker to the desired location. If you want to set a different pivot for another drawing or symbol cell, select the drawing or cell and in the Camera view, set the new pivot. Make sure the Set the Pivot for Symbol on All Frames button is deselected.